It is already the time when you have to teach your child how to “do it” into the potty? Just take a deep breath, you are not alone in this truly difficult journey. Many moms did it, so you can do it too! Let’s be realistic. Toddler’s poops are a huge mess to clean up and so much better suited for the potty. Just show that that inside to your toddler and say that this should have been done in the toilet. This is a great start, trust me. Showing exactly what to do to your child was not enough, he is just not into it. You know when you want your kid to eat something healthy and he does not want it, but when his cool dad or brother eats it, he wants it too? Same with potty training. Just invite your toddler’s pal who already does it into the potty. You will see, this simple trick will definitely trick your kid into doing it to potty too. Just because you see some pal of you toddler, who is same age as your child, wearing simple undies, it does not mean that your child is ready for it too. If he does not fully get into the swing of the training, just wait a bit longer, until he will be fully ready. You might wait only a few months or maybe even a year. But when the time comes, he should get it in few minutes. There is no possibility to stay home all the time, even if it is much easier to be somewhere familiar when you are training your toddler. 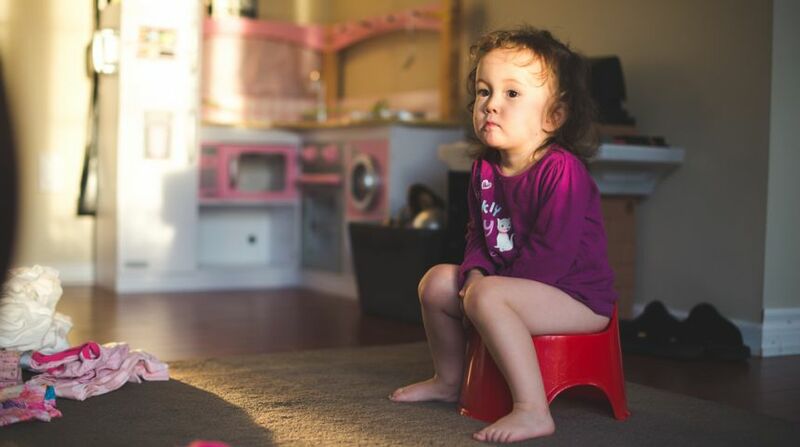 Just because you are potty training your child, it does not mean you have to go crazy by staying at home all day long! Get out and try to maintain a usual schedule. Just take your potty in the trunk of your car. You will be happy you have it for long trips or for afternoons spent outdoors, especially at a park with no bathroom. If your kid does not want to train on children’s potty, he agrees only to practice on the regular, the same that you do, does not matter that the toilet is too big. If he refuses to use the baby potty or even those seats that fits onto the toilet, just let him sit on the regular toilet, only backwards. It might sound and look strange, but it should work. If you will try it, no one will lose. When your toddler is doing great job at home with you, but does not do the work at school, use the key – consistency. Does not matter what you do at home with your potty training plan, you must to do the exact same elsewhere. For example, if your child prefers to read a book while on the potty, make sure he will be treated the same elsewhere. If daycare centers just does not have the time to adapt to each child, just ask them how they think they could help to reach success you have had at home and compromise. Maybe change something at home that works at daycare. Your child just will not move when it comes to doing business outside of a diaper. Arms crossed, bottom lip curled, and here you go, diaper is full. You have no idea what to do with your resistant child. You should just keep potty training efforts full of rewards and praise. It is very important for a child to feel that he has control over the this process and it is crucial that he perceives the experience as a positive one. Put all the focus on asking to go to the bathroom and willingness to sit on the toilet. You might try buying a special “potty” book, wrap it up, and let your child unwrap it if he sits on the toilet. It is long and much effort requiring work for parents, but what else you can do? This is the training that must be done, so just get your hands dirty and do everything that job would be done.